Welcome to UK Record Office! The legalisation of documents is often referred to as an apostille stamp. 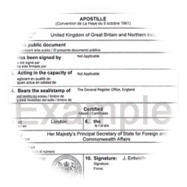 An apostille certificate is a seal that is embossed into your document or certificate like a stamp or seal. 1. The document is checked to make sure that it is genuine and that it has been presented in the correct format. 4. The document and the apostille are then placed into an embossing machine so that the document and the apostille certificate are stamped. The apostille stamp is not an ink stamp, it is an embossed stamp. All of these refer to the same process of issuing an apostille stamp which is then embossed with a stamp or seal. It is simply a case of people using different terms. Notarisation is a formality often required for documents which are to be used overseas, or for certifying document copies. Once a document has been notarised by a Notary Public, and if it is to be used overseas, it may need to be apostilled. This means that the Notary's signature and seal are certified, an apostille stamp or a Legalisation Certificate is addded to the document. Once a document has been notarised and apostilled, it then may need to be legalised by the Consulate of the country in which it will be used, if the country is not party to the Hague Convention.